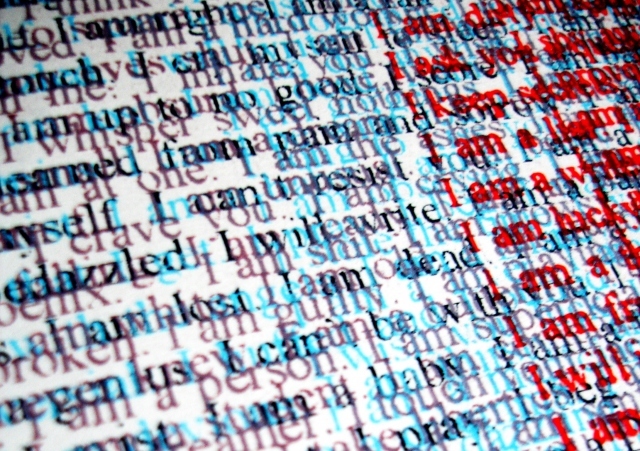 Nicola Anthony has been selected for an exhibition of text-based art, opening in L.A., Aug 2012. This unique art exhibition held at the Bleicher Gallery La Brea in Los Angeles will display a compelling array of contemporary text based works encompassing a wide variety of themes and concepts. The works on view will traverse diverse styles and sensibilities, delivered with skill, intelligence, wit and innovation through a myriad of themes ranging from public to personal and media including: illustration-pyrography (drawing with fire/heat), kinetic sculpture, collage, interactive installation, neon, l.e.d., video, sculpture, assemblage, painting, and photography. Text : Message” (The Alchemy of text-based Art), curated by Joella March, will be on view at the Bleicher Gallery La Brea, 355 North La Brea Avenue in Los Angeles from 15th August – 10th September 2012. The Artist Reception will be held on Saturday August 18th from 6 to 10 pm. Bleicher Gallery La Brea specializes in works by artists that have crossed traditionally contentious art ideologies. Our artists are strong in innovation while remaining emotive/conceptually engaging and cross academic vs outsider art world divides. Bleicher Gallery La Brea is located at 355 North La Brea Avenue in the Mid City West District, home of the Miracle Mile Art Walk. We are pleased to share company with some of Los Angeles’ most respected and established galleries and museums including Jack Rutberg Fine Art, LACMA, ACE, and Stephen Cohen Gallery. For further information, see http://www.bgartdealings.com, or call the gallery at (323) 930-2240"